Malcolm Jenkins may have single-handedly saved the Eagles defense last week. The Eagles are in a bind right now, with a depleted secondary that features guys like Tre Sullivan, Cre’Von LeBlanc and Chandon Sullivan. Not that long ago, the trio was on the street, looking for an NFL job and watching Jenkins on TV. Now they’re beside him on an NFL field — learning, growing, and being coached. That’s where Jenkins’ ‘C’ is being extended beyond his leadership role to now “coach,” showing the new guys where they belong on the field. 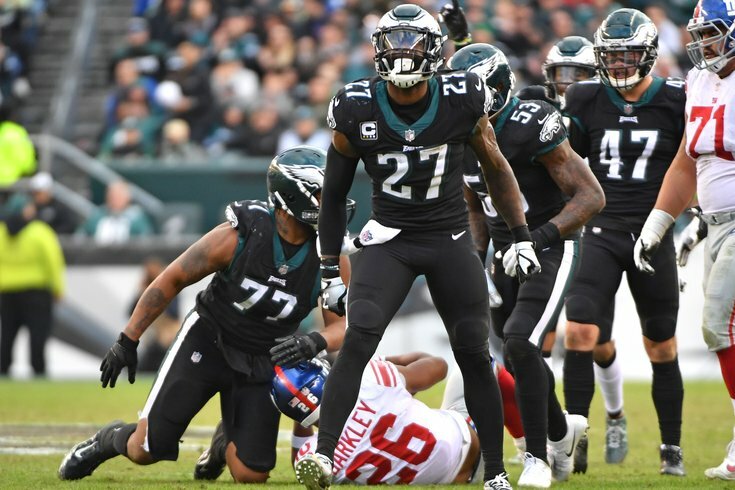 “Some of the stuff going on out on the field you can’t wait until you get to the sidelines after every drive to correct some things, sometimes you have to correct some things yourself out on the field on the fly,” Jenkins said. “I would say I’ve done more correcting this year than I ever have in past years, because we literally have practice squad guys starting and guys who have been on this team for three weeks. “That puts a lot of that extra communication on myself, Corey Graham, the veterans, to do what we have to do in making sure everyone is on the same page and where they should be on the field. Once we simplified things (on Sunday against the Giants), we were good. Everyone adjusted and knew where they should be. “We stayed in man(-to-man) defense. We just had to make sure there were no checks; we had to make sure everyone lined up and played our defense like we know it. I think it’s a way to look forward. We had our one-on-one matchups. I mean Cre’Von made a really nice play there in the end on (Odell) Beckham (when LeBlanc batted a pass away that was intended for Beckham in the end zone on a third-and-four at the Eagles’ 11 with 5:56 to play. The play resulted in a Giants’ 26-yard game-tying field goal with 5:52 to play). “We played some zone. We play matchups and zones, and they’re interchangeable. We never truly play one or the other. The play LeBlanc made on Odell was one-on-one. We actually had the coverage pushed going the other way. The Giants game may have been more of a settling game for the Eagles’ defense than the naked eye revealed. The Eagles have five more games left this season and each one will determine their season. A revolving-door secondary at this stage is disastrous. On Saquon Barkley’s 51-yard, second-quarter touchdown run, which put the Giants up, 19-3, with 4:06 left in the first half, the Eagles were caught in a check and out of position. Moving forward, Jenkins stressed, that won’t happen again. “The guys are making some small mistakes, and whatever they are, they know and are correcting them,” Jenkins said. “The NFL is a copy-cat league and the mistakes we made (in the secondary) will continue to be tested I’m sure (by Washington). We can expect to see the same runs and same plays. “People found out against the Giants who Cre’Von LeBlanc is. Two or three weeks ago, he was out on the street. Besides me, it seems, our whole (defensive) backfield was out on the street two or three weeks ago. Cre’Von is scrappy. He’s not one of those guys who gives up a play and all of a sudden goes into the tank, which is what we need out of him.